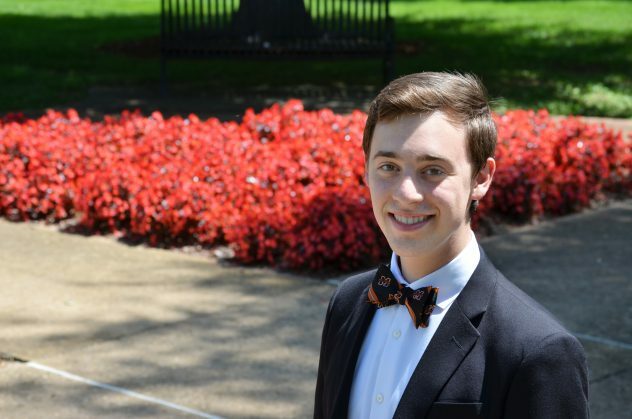 MILLIGAN COLLEGE, Tenn. (March 29, 2019) — Milligan College senior Robert Weber, of Jonesborough, Tennessee, will perform a senior voice recital on Sunday, April 7, from 3-4 p.m. in the Mary B. Martin Auditorium located in Seeger Chapel. The event is free and open to the public. Weber has been an active member of the college’s music program, performing in the Concert Choir and Heritage. He is a double major in music performance and biology. The program will include works from “Let Us Garland Bring” by Gerald Finzi, as well as pieces by Debussy, Mozart, Puccini and others. Weber identified his finale, “The King of Love My Shepherd Is,” as his favorite piece to prepare. Weber was first introduced to Milligan through a musical competition as a freshman in high school, and he has remained involved in music at Milligan for the past eight years. In high school, he performed with Milligan’s choir and enrolled in dual-enrollment courses. Weber plans to graduate in December 2019. Posted by aegreer on March 29, 2019.